Couple days ago I've run into curious issue, how to print Classic report from Apex 5 application. I have no ORDS 3. on my humble Fedora VM, and I not realy want to install it. Oracle BI Publisher ain't option (unless you run corporate reports on OBIEE 11g/12c). 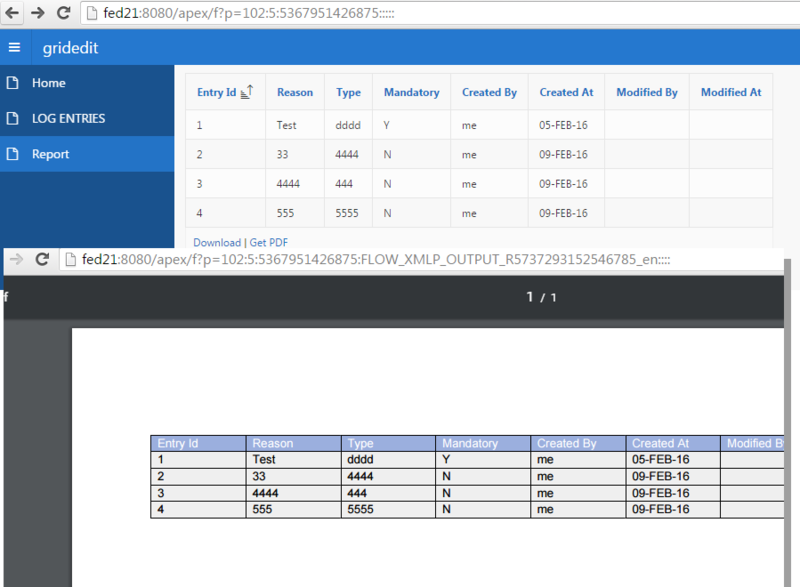 Well Apex has the 3rd option - External - with Apache FOP. Yeah, right! It has to be a servlet in your apex/utilities/fop folder. OOps, it used to be there. Well, not a big deal, anyway it is a single JSP application with Apache FOP libraries and one big issue - it works out of the box only on Oracle Application servers, for all other cases you should get somewhere Oracle XML Parser libraries (for example - download XDK). processors. Out of this great discussion you may find whole source of fop.war servlet. Okay then, we will create our own servlet with blackjack & ..., oops with FOP and standard Java XML parser. Application should respond back with PDF document. 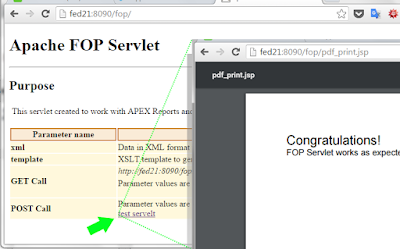 JSP to get parameters from APEX and generate PDF page. Let's chase to the source. Now make sure, that your WEB-INF/lib folder contains libraries to run FOP driver. I've found old distribution with few libraries. that is how it looks like in my NetBeans Libraries list. Well, that's all folks. If you use NetBeans or just have got my war archive - time to have fun. Copy archive to your Tomcat webapps folder and try to open /fop page. You should see this some ugly page as on picture below. This means your application is up and running and click on "test servlet" URL will show you generated PDF document. I don't see how you may run into issues with that, on my Tomcat 7/JDK 1.7 it runs out of the box. Now you are ready to change Apex print configuration. Set Report printing properties as below. Personally I prefer to open PDF in browser, you may pick attachment and download report as PDF file. NO reason to select anything else. It is a PDF generator isn't it? If you know meaning of the other parameters you can change them. I left rest of the items intact. Save region settings and run your report page. You will see your Link label next to Download and if you click on it - you will get your PDF printer like I've got mine. Here is web application to save your time and there is a GIT source code and libraries.